tastes, habits, ideas and way of thinking of the Europeans have shifted too. grass at hand to thatch their roofs. Nevertheless, this is not the only reason. with nature are aspects that scream out to modern Japanese. ●Thatch is the most eco-friendly roof you can get. many such products are imported from overseas, which also adds to CO2 emissions. 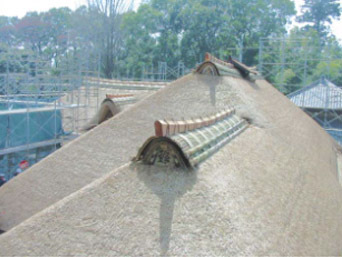 absorbed in the thatch during growing without adding more in the roofing process”. ●Thatch is cool in summer. will soon turn moldy, which is something that never happened when the roof was just thatch. year 806), still standing today, bears witness to this. As I said early, Ise-jingu has had thatched shines for 1300 years. My personal opinion is that miscanthus thatched roofs can be divided into three stages. homes in the towns of the Edo period were thatched, but crudely so. thatched roofs, which were regarded as status symbols by the general public. thatched house, the village headman’s. 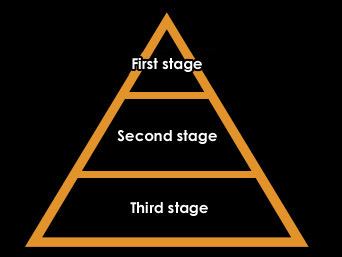 At that time, there was no 2nd stage. Nevertheless, from the end of the Edo period onward, and into the Meiji period, came an era in which the thatched home was popularized. What made this thatch status symbol feasible for the masses was the functioning of a “mutual aid system”. Regionally, these were know by various names, including: “Yui”, “Ko”, “Tanomoshi” and “Mujin”, all loosely meaning mutual association, and functioned as follows. their association, with the association providing the miscanthus thatch, the fastening ropes, labor and money to the chosen house(s). a vast amount of thatching material and labor when it was the turn of your house to be thatched, without having hardly any financial burden. 3rd stage roofs can be seen, as they were built only as temporary shelters. Given sunshine, water and earth, miscanthus grass will grow each year eternally. This surely was awe-inspiring to the ancient Japanese. go on forever. Likewise, people ? vulnerable like the living grass ? took the blessings of sunshine, water and earth in the hope of continuing on forever. Thatch is the “form” expressed by this “sentiment”. nostalgia ? the “shape” arousing “sentiment” in a reverse effect. Will a culture that embraces oil, iron and concrete continue forever? Doubts have been sewn, and modern man is contemplating them. ●Miscanthus thatch expresses a giant 3-D universe. With thatch, the “nature-linked elements” (sun, water, air and soil) can be taken as the X axis, and the “human-linked element” (engineered by mutual aid) as the Y axis. And if our planet earth is portrayed using those X and Y axes, and “eternalness” added in the form of time axis Z, a giant universe in a three-dimensional matrix appears. who spend their time in transient affairs, it is only natural that they will have difficulty understanding the three-dimensional universe expressing the lives of ancient Japanese. In Kita-ku, Kobe, stands the Hakogi-sennen-ya (Hakogi family house of a thousand years), by all accounts the oldest private house in existence in Japan. And here I would like to introduce a conversation with Mr. Hakogi. 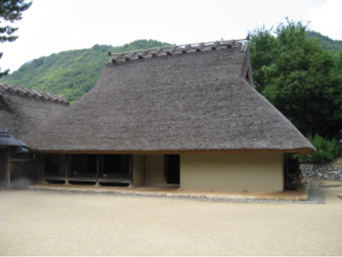 The Hakogi house was reassembled on its present site to make way for flooding of land in a dam project. Another time, a French visitor also went home in a rage because the only foreign language explanation was in English, there was no French. Their anger comes from knowing well the importance of maintaining national heritage, and from knowing what it is to lose such heritage. we are extremely insensitive to such issues. ●Thatch is the path we Japanese have pursued to find “wellbeing”. A thatched house is not necessarily an easy one to live in. which has created an enormous upkeep burden for later generations. These are proving to be large factors causing the disappearance of thatched houses today. Yet, were the Japanese tastes, habits, ideas and way of thinking represented by thatch mistaken? That, including our present stance, will be something determined by future history.
. Ancient Japanese developed their thatched homes with the hope: “May this house continue on in peace forever”, and, so, thatch is a path and a testimony that we Japanese have pursued for “wellbeing”. There are no differences between past and present. And that is borne out by mankind’s continual challenge in pursuing “wellbeing”. Thatch is something that our forebears left us as one of the paths we could pursue. We should pay our respects to that path, learn from it, and add to it. Copyright(c)2009 yaneharu All Rights Reserved.